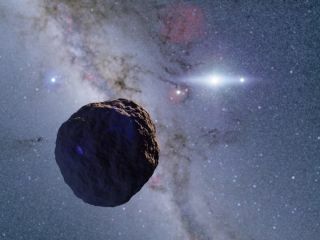 An artist's illustration of a newly detected 0.8-mile-wide (1.3 kilometers) object in the distant Kuiper Belt, beyond Neptune's orbit. The far outer solar system is teeming with mountain-size space rocks left over from the planet-formation period, a new study suggests. Astronomers have apparently detected a 0.8-mile-wide (1.3 kilometers) object in the Kuiper Belt, the realm of icy bodies beyond Neptune's orbit. If the newfound candidate is confirmed, it would be the first Kuiper Belt object (KBO) ever known in this size range, study team members said. This information, in turn, may reveal key information about how planets grew and evolved long ago. "If this is a true KBO detection, this implies that planetesimals before their runaway growth phase grew into kilometer-sized objects in the primordial outer solar system and remain as a major population in the present-day Kuiper Belt," the researchers wrote in the new study, which was published online today (Jan. 28) in the journal Nature Astronomy. KBOs such as the newly detected candidate are too faint to be seen directly, even by the most powerful telescopes operating today. So the study team, led by Ko Arimatsu of the National Astronomical Observatory of Japan, took an indirect approach. The researchers monitored about 2,000 stars for a total of 60 hours, looking for "occultations" — dimming events that could betray the presence of KBOs passing in front of the stars. They did this work on the cheap, using two small (11-inch-wide, or 28 centimeters) telescopes that they installed on the roof of a school on the Japanese island of Okinawa for a project called the Organized Autotelescopes for Serendipitous Event Survey (OASES). "This is a real victory for little projects," Arimatsu said in a statement. "Our team had less than 0.3 percent of the budget of large international projects. We didn't even have enough money to build a second dome to protect our second telescope! Yet we still managed to make a discovery that is impossible for the big projects." Now that the researchers know their methodology works, Arimatsu added, they plan to study the Kuiper Belt in even greater detail. "We also have our sights set on the still undiscovered Oort Cloud out beyond that," Arimatsu said, referring to the solar system's comet repository, which is thought to harbor trillions of icy objects. Mike Wall's book about the search for alien life, "Out There" (Grand Central Publishing, 2018; illustrated by Karl Tate) is out now. Follow him on Twitter @michaeldwall. Follow us@Spacedotcom or Facebook. Originally published on Space.com.